Uniqlo's new brand ambassador is up and running at Wimbledon with a routine 6-1, 6-3, 6-4 win over Dusan Lajovic in 1 hour and 19 minutes. The Swiss, returning as defending champion, barely broke a sweat as he comfortably dispatched his opponent with some rock solid serving losing just 11 points on serve over three sets as he moved into Wednesday's second round. Federer won the toss and elected to receive. Lajovic held to 30 before Roger levelled with a hold to 15. In last year's encounter, it was the Serb who settled first but here Roger took charge early, breaking to love fo 2-1 and consolidating the break aided by some slick serve and volley play. 3-1 was soon 5-1 and Lajovic couldn't trouble the scoreboard again, dropping serve for the third time as Roger took the set 6-1. Into set two and a comfortable hold put Roger 1-0 up before he broke Lajovic to 15 for a 2-0 lead. That cushion allowed Roger to relax big time and he began to roll through his service games, holding easily en route to a 4-1 lead. In game six the Swiss had a further chance to break but Lajovic ground out the hold, and although he was able to hold again for 3-5 there were no inroads on the return as Roger took the set 6-3. Set three saw Lajovic again broken in his opening service game before Roger consolidated for 2-0 and put one foot in the second round. A love hold for 3-1 was followed by a missed break point chance and although the Swiss wasn't able to secure a double break he cruised over the finish line serving it out to 15. As far as ideal first rounds go this one was pretty much peRFect. Last year Lajovic actually caused Roger a few problems early doors but this year Fed was the first to settle and once he got the set lead he was on cruise control. I thought Lajovic looked pretty nervous early on with how he was moving/hitting the ball and although he did start to play better in sets two and three Roger was just too far in front for it to really matter. You can't give this guy a set and a break head start before you manage to hit a ball in anger as he's just too good a frontrunner. Looking at the stats the Serb only won 39% behind his first serve in the first set which is pretty terrible and Roger was dominant in all areas. He was pretty good on the breakpoint conversion as well too so hopefully, he can keep that up for the fortnight. So a simple start, some good movement, zero energy wasted and he looked very confident out there with some crisp tennis. Naturally, there's no point getting carried away too early, this court will wear fast this week which is going to favour baseliners and it's back to point for point mentality on Wednesday against either a guy who won three matches to get here or the Eastbourne finalist. Should be slightly tougher than today. Next up is Lacko who defeated Bonzi in four sets. The Slovak made the final in Eastbourne last weekend so he's got some form on the grass but I think Fed handles him comfortably. Eastbourne was only his second ATP final so he doesn't have a ton of experience at the business end of tournaments and is 0-18 vs top 10 opposition. Roger leads the H2H 2-0 so I think he'll come through in straights with maybe a tight opening set. Cruise control from Roger who had the measure of his opponent from the word go. Ideal to the potential 2 weeks ahead. I wonder if Fed will keep his custom shoes, now that he has broken relationships with Nike. As you can see, these ones aren’t your normal Vapors sold in a tennis store. I believe that they are a heavily customized version of the Lunarlite Vapor Tour (a model from 2010)…. Fed’s USO outfit if he had stayed with Nike. Fed about his RF brand at the interview after his match. Some people have tweeted that Fed said in his interview after the match, that he doesn’t even have a contract regarding the shoes with Nike. Possible that he might change shoe brand and might explain why his shoes have blue details instead of a red color as the one on his UNIQLO outfit. Shoes are pretty important. I guess he might test some at some point if he feels the need to change? Djoker wore Adidas I think when he was with Uniqlo? So maybe he just sticks with them. Yes, Djoker wore Adidas shoes when he was with UNIQLO. IDK about shoes, but some people suggested that he may use Adidas shoes at some point but it seems like he is sticking to Nike. Clothes you can change and it doesn’t matter – much. Shoes are a different matter. If you’re really comfortable with them, and rely on them for secure footing, I think it’s probably more difficult to change. Do you want to take the risk? Not sorry to be missing out on the USO outfits, though – they look weirdly like cricket jumpers. Younger generation pretty much inconsistent. Yup I had him losing first round. The guy has no grass game. Medvedev does. What about Halle? Isn’t that some sort of grass? Coric won some games there? What do you think Halle was about? Is SW19 very different conditions wise? Now thats music to my ears. All Hail Mr Uniqlo , Shame on Nike. I dont blame em really. $300 million. I guess its plain and simple business. HaHa! Some sort of grass!… Yes, at a point the base line zone was more similar to a 19th century footbal pitch. SW19 is deffo a lot different conditions wise. But Coric has zero record of doing well on grass, he served well in Halle, played some good matches but RBA would have beaten him and he took advantage of Fed playing way below par in the final. What a move to announce new partnership with Uniqlo. Hope they will do a better job than Nike. A good first match by Roger, firing all cylinders. One of his potential 4th round banana peel is out just as Jon predicted. Cilic and Querrey looking sharp too. Yeah good wins for Cilic and Querrey. Gasquet gone, Coric gone, Dimitrov gone. Great win for Stan but Dimitrov, that’s a shocking loss again. The BBC Sports channel had a reasonable number of live matches showing including Fed’s. We watched on a PC, not having access to a TV. Thanks, Sheila. Trouble is, I need the computer to work on! Haven’t got the space for another monitor, Jon. Have retuned Freeview now, and hope that’ll work for tomorrow. Otherwise it’ll have to be a mini-Window on the laptop, and that’s not compatible with my work software. Pleased to say that retuning worked, so I now have the full half-dozen channels from one at least of my Freeviews 🙂 Obviously must have un-retuned the Red Button at some stage. Thanks Jonathan. You are on a roll as well. First off, ESPN is a joke. Two channels showing Keys or Stephens play. They have a routine of only showing Fed if it’s a tight match. Hello, you can’t broadcast centre court on at least one feed? As far as Uniqlo, sad for me not to see the RF logo. Why did he sell it to Nike? The shorts are longer and tighter, Shirt tighter fitting too. I think it’s more tailored looking but not a fan of the square. Wonder what Djoker thinks? Maybe Fed should have created his own RF brand! The match was routine and so so nice to see Fed back on centre court! We are so lucky. Roger didn’t sell the logo to Nike: Nike applied for it. Guess the yanks will take precedent on EPSN. Hopefully won’t be long until most of them are out lol. Nike registered the trademark for the RF logo in 2010. So they’ve always owned it. I would guess at the time Fed & team figured Nike may as well just do the application as they’ll have a team for it, ease of getting it granted etc. etc. Or maybe it was just part of the contract. I think the Jordan logo is also owned by Nike, not MJ himself. It’s a bit like letting a web designer buy your domain name for you, sounds good at first but if things turn sour they are the ones in control. I imagine it’s just going to sit dormant now until he is able to secure the rights to it. Nike won’t be able to use it I don’t think. Not much point in them hanging onto it (or will they use it for the shoes?). Probably just a question of how much they’re asking to assign it to Roger. EU trademarks, at least, are valid for only 10 years, so this one will be coming up for renewal in 2020. OTOH, it’s possible for competitors to apply for it to be cancelled for non-use, but I don’t know how long that would take and whether it would be worth doing. I suspect it wouldn’t, for a variety of reasons. When Roger is interviewed he has questions asked in 4 languages English, French, German and Swiss. And I speak French and he speaks so beautifully. What an amazing man, no wonder he has been a fan favorite for over 15 years. Roger the pure definition of class. And I am happy that Jonathan was right about Coric he looked terrible, there is a difference in Halle grass courts and Wimbledon grass courts. Yeah I think I tweeted or put in the comments why has Fed just lost on grass to a guy that will lose in 1st round of Wimbledon 😀 finally one of my predictions comes off. So Coric is out, oho, following the trend along with Kokkinakis beating Fed then losing subsequent matches. I am now going to disagree with myself on a previous comment concerning Nadal’s draw, seems like an easy ride for the first few matches at least. Fed looking relaxed, maybe too relaxed at one point when he had his customary snooze but not a very long one. Super fast post Jonathan, and at least you have alternate days off for this tournament. Yeah the day off during slams is a godsend! A great result and Coric out too.Most pleasing. He was not in great physical shape then, and his confidence was much lower than it is now. I don’t think there are any similarities at all. He could just as easily roll through the second, third, and fourth rounds just like he did in 2006. Maybe no similarities, but it’s a reminder not to get carried away after a 1st round win. 1 match at a time. Now Alison,you are handwringing.That is not meant to be condescending as I do it more than anyone.But I think a sharp match like this was necessary after the Halle defeat.Also wasn’t 2013 the year Fed had a really bad back.? Not, as far as we know, at Wimbledon. And I wasn’t handwringing, just reminding myself that one swallow doesn’t make a summer. Or as Jon says, not to get carried away. So it’s Uniqlo now, so glad, it has some fine quality items. 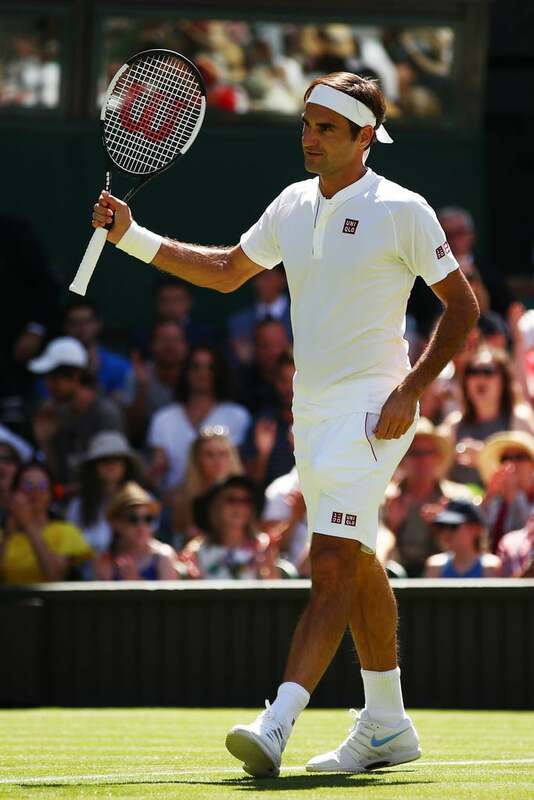 Roger looked so smart in strict white, he enjoyed his first match, some great shots. A pleasure to watch. Do they make decent stuff quality wise? I’ve been in their store in London but it was jam-packed so didn’t really spend much time looking. Some weird designs on their website, I just looking at new arrivals and nothing takes my fancy, only “room shoes” and some of the socks. I have an ultra light down jacket and also a vest and both are super quality. Im a fan of uniqlo. Very comfty in casual clothes. The fabric was awesome…dont know about their sporting clothes though but if they use the same fabric guaranteed that it will be good to fit in roger..here in asia uniqlo was quite popular.. not sure about headband though.too plain..lol.. about their designs it was plain sometimes but it was popular coz it was really great to wear. Great first round for Roger. Moving well and striking the ball well, ignoring his shanks in the second set. Should be in the second week with no issues. Once the grass wears off and starts playing slower, it will get tougher. But that is nothing new for Roger. Hope all goes well for the next 6 wins. Yeah I hope the grass shows some durability. Get Nadal on Court 1 instead. I don’t think we can read too much into this match, Lajovic was very poor indeed. I think Roger did as much that was needed and no more. He shanked a few shots here and there but overall still nice to get the match done and dusted. Hopefully he has some more gears to go up when the going gets tougher. IDK about all of you guys, but IMO, I would have really liked to see Fed in Adidas apparel. For me, Fed with UNIQLO is an unusual combination. Agreed!! It’s reallr weird to me. HI guys! Great write up J, and we are off! I was on CC today and it was fun! Fedqlo was solid and Lajovic was terrible! Once Fed got ahead, I kept clock watching wondering how quick it would be!! I like the change, Nike hadn’t bothered for a couple of seasons really, it’s time to embrace newness. Fed looked energised as a result of everything being sorted. Kind of explains his grumpiness past few weeks tbh. His whole camp were buzzing with energy. Change is good and hopefully Fed can build from this. So Coric, Grigor already out! Cilic looked full of confidence and I also watched Monfils play beautifully v Gasquet! A day of upsets all round. Thanks for the quick recap Jonathan as I could not watch the match. Very smart as usual ! Quite surprised he wears Uniqlo but not so important as the white colour is compulsory at Wim. and the shoes are still Nike. It seems it was an easy win under the sun in front of a fully packed Central Court :-). On Be in Sports France tonight, the journalists commented on the Uniqlo deal and one of them said that maybe RF would play the Tokyo atp 500 (Oct 1-7) this year for the Japanese ? Do you think it would be feasible one week after the Laver Cup and just before Shanghai atp 1000 (Oct 8-14) ? If he wants to aim at the number 1 position ahead of the London atp finals + end of season and reach/get beyond the 109 titles Connors record, he might try to play both, no ? When I first read about Fed’s possible Uniqlo contract in mid-June I thought ‘wow how strange’. However … over the last few years I’ve gotten so tired of those Nike kits. Yes, on the men’s side Roger and Rafa get their uniquely designed kit. But they are still forced to the same colour scheme. French Open/clay season 2018 everyone in turquoise, Australian Open 2018 pink, US Open 2017 black/red/grey, etc. While this is kind of boring, really frustrating is to watch matches with the lowest level Nike-sponsored players wearing, at times, the exact same kit on opposite sides of the court!! So why not Uniqlo to transition in to retirement, street apparel, and not have so many similar kits on the tour 🙂 Will wait to hear what happens with the shoes and the RF … Bottom line is good luck on the court Roger!!!!!! If Fed is able to get his RF logo back, where would he put it, left sleeve of the shirt? (Right one is UNIQLO branding in Japanese and English) According to Jonathan, the unoccupied sleeve will maybe have some sponsorship, so TBH even if Fed is now with UNIQLO, plenty of unknowns. Coric losing kind of makes the final loss in Halle look worse to be honest, but Fed here played much better than he did all week in halle. Bad loss still of course but if it fired him up to do better at Wimbledon even a little bit I’d take it. Wawrinka v Dimitrov was pretty good to watch. Not sure what’s up with Dimitrov actually, seems like he’s in a rut. I expect he’ll play his way out of it but could probably do with a short break now he’s out early. Hoping Stanimal does well here, he’s looking better, slowly but surely. Still not sure how anyone has Nadal over Cilic. Cilic imo is a much better player on grass these days, I’m hoping both Nadal and Djokovic are out before the semi final point as I think if the draw holds Fed will need his A game against Cilic. I haven’t seen the Stan/Grigor match yet, but from what I heard on the radio I suspect it was same old same old – lack of belief/confidence on Grigor’s part. I still maintain I doubt he’d have won the WTF if Goffin hadn’t gifted him the match point.
. About his match last night looks pretty good. but some of the shots were flying. Saw Cilic match at he will be a a real threat… But forehand and backhand looks pretty good for Roger just a little bit patch would be nice..
Yeah.. I move on with the brand and stuff…. But what do you think about the decision of Roger’s team? minus the money.. The logo is very important. Although there’s a rumor that they will give the logo after few years but he knew that logo was his trademark. What do you think guys? I think its hard for him to give up that. I don’t think there would currently be anything to stop Roger from registering his initials as a trademark for anything but the Class 25 (footwear/clothing/headgear) Nike have it registered for (but not perfume again, please! ), certainly not if they weren’t in the same format as the Nike one. Equally, an arrangement could be made with Nike for them to abandon use for the clothing and headgear, and just restrict it to sports shoes or something, I suppose. Roger’s really whipping the ball, maybe that’s just how it looks when the courts are “playing fast”. 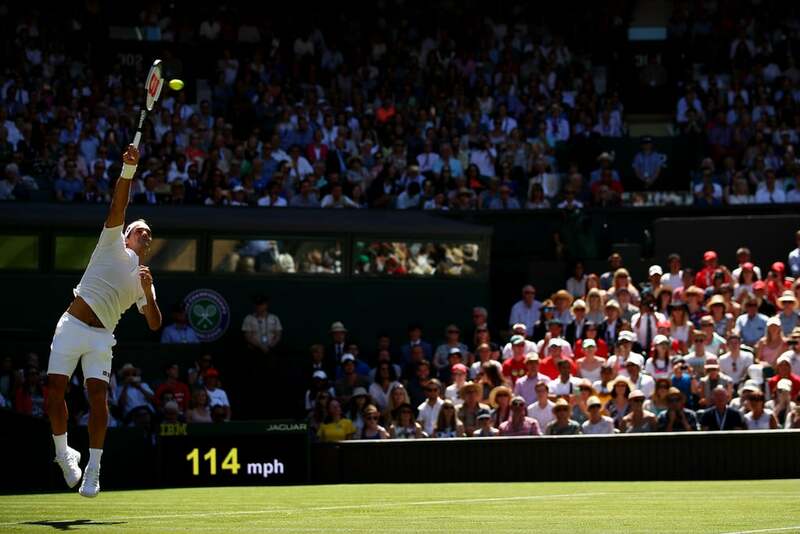 Has room to get more comfortable moving around, & maybe with how the Wimbledon balls are performing AT Wimbledon – but there were a couple of places where his split-second analysis of the trajectory was spot on, & he let a ball go that turned out to be out. So. Uniqlo. I actually really like the thin red piping detail on the edge of the neck placket – the red of the logo, of course, should be the same. It should also be SMALLER – a massive red square is annoying & ostentatious, which is not consistent with either Roger or Japan. I think they could easily go with a single smaller Japanese-only logo – they’re going to get massive brand recognition with Roger on board, without having to repeat themselves. Interested to see what som eof these “special projects” are. Roger does seem in a better space – deal done & public, weather suits him better, &’of course the family’s with him. Hoping for more of the same come Weds. Not sure whether to be pleased Coric is out, or worried Roger won’t be sufficiently challenged! semi if the seedlings hold up and Cilic is there.And who knows who will make the final on the other side.For me,bloody Del Potro would be the ultimate night mare.But who knows,that is why grass court tennis is exciting,it’s very unpredictability,so different to the boring slugfest of clay.? time adding to it the RF logo scenario. However if he had to make a change then he sure did it with a bang. Thanks for the write-up, Jonathan. Indeed a routine win. Both Roger and central court are in immaculate condition, very pleasing to see. Even Robby and Lynnette sat together, showing the tremendous confidence 🙂 . One down and six to go. Wow, an exclamation only reserved for Roger Federer on a tennis court, but Jonathan you said Coric would go out. You know your stuff. Respect. Looking at the stats for Roger’s and Lacko’s, it should be an easier match than the first for Roger. Third round would be more challenging relatively..
Fedexperience lasted too short but hey I am forever on cloud nine! And was great watching loads of SHBH’s in a day, 4 of CC players and Kohlschreiber from the bar above as an hors d’oeuvre. Okay, 6 more to go, allez! So great for you and Susie! That’s awesome, Wanda! Really pleased. Thanks guys and wishing all fed/tennis fans here have a chance to see him once on the grass, especially at Wimbledon CC. It’s indeed a very special place. I did post a reply but then we had a tremendous thunderstorm and power cut.An amazing experience that I am sure that you will treasure for ever.Will you be seeing any other matches? Sadly no, not this time, Annie. Hope you’re having a lovely time in France! That is a shame but such a wonderful memory. Very hot here,cooled off down a cave and saw incredible cave paintings,13000 years old. A 10 year, $300,000,000 deal? I have two questions: How long does this man intend to play? And how much money does he have now? A billion dollars? I don’t know if other companies have reached out to Roger (or if he has reached some of them) but there are people who are claiming that Fed joining UNIQLO might mean he might try Tokyo 2020 and that he might start playing the Rakuten (Tokyo) 500 tournament… We’ll see eventually. FUND, that was supposed to be FUND. No Jura and Credit Suisse patches Jon! Same shirt as round 1, glad he didn’t add sponsors. I’m sure they’d need to negotiate if they want their brand be advertised on the shirt, it’s certainly not in their contract so far. Maybe there’s a possibility that Nike is slowly quitting tennis? O_O Why do you think that? Because they didn’t give RF $300m? That’s an insane amount (and even more for a tennis player who will retire soon). No, because look at their quality dropping quite quickly for their last years. I have seen their tennis products and I can tell you that their quality has dropped by quite a bit. On the contrary, speaking of tennis products, Asics, Adidas and even Babolat aren’t faring badly, some of their products are superior in quality than Nike. Nike was good a couple of years ago but they have seemed to drop the ball. The other thing is Tennis doesn’t even get accounted for as a separate business in their accounts. So it’s clearly not a huge focus. It must be a small portion of revenue compared to their other lines. And I agree with the quality dropping off, their stuff can be quite hit and miss. No idea about Uniqlo, but people are saying the quality is good. I remember that when Djokovic was still with UNIQLO, I have looked at their shirts and they were actually pretty good quality, impressed me knowing that they are not really a sports apparel company. I haven’t seen their Nishikori products though. Been also quite impressed with Adidas products lately, seemed to me that their quality has improved (like Babolat) and Asics products are really solid.